Deluxe room（30sqm) is elegantly appointed with everything a guest needs: a small workstation and desk light, as well as luxuries such as an 8 feet wide mattress is a enough for single use, double height windows and all-glass walled bathrooms with blinds to allow unfettered views of the bedroom and city beyond. 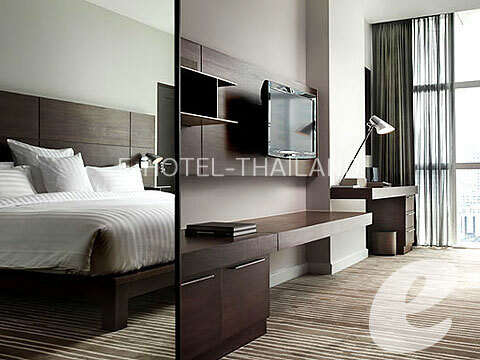 Indeed, the layout is so well designed and spacious it is hard to believe the room is 30 square metres. 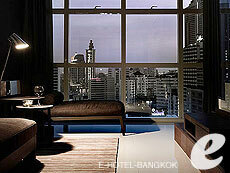 Panorama View Suite ( Double )(70sqm) has a wall of curved windows running along one side. Near the entrance, a marble topped pantry counter seamlessly widens to a marble topped workstation diagonally opposite a small living set arranged near the windows. The 8 foot wide bed stands in pride of place against the far wall. The spacious bathroom hidden along the interior wall is warmly lit. Room of One Bed Room Panorama View Suite ( Single ). Room of One Bed Room Panorama View Suite ( Double ). 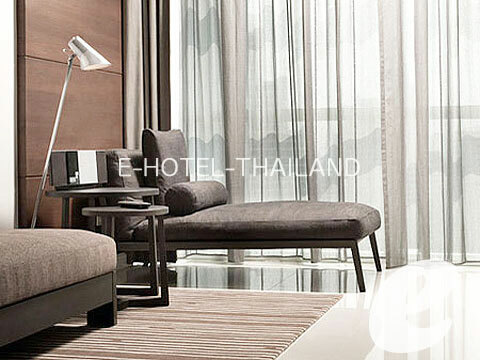 Family Residential Suite(165+90sqm) retains the sleek,clean lines of the brand. There are openkitchenette,a marble topped counter with high bar stools,comfortable living area with 50 flatscreen television. The first floor has the dining area, powder room and the beautiful master suite which has a separate living room and a sauna in the bathroom. 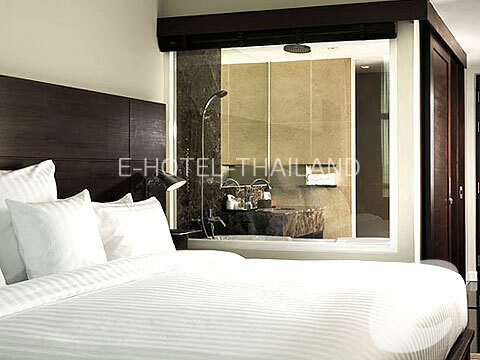 The second floor has two bedrooms, one double and one twin with ensuite bathrooms. Deluxe ( Double / Twin )(30sqm) is elegantly appointed with everything a guest needs a small workstation and desk light, as well as luxuries such as an 8 feet wide mattress is a enough for 2 person, double height windows and all-glass walled bathrooms with blinds to allow unfettered views of the bedroom and city beyond. 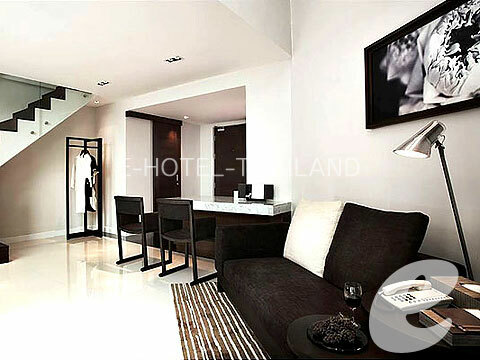 Indeed, the layout is so well designed and spacious it is hard to believe the room is 30 square metres. there are connecting room available. 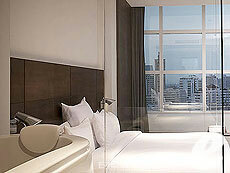 Junior suites(40sqm) are boast two glass walls for superb panoramic views. The entrance to the walk-up suite opens up to a leather armchair underneath a curving hardwood staircase. The upper landing is neatly kitted out with a small pantry and workstation. The bedroom has a two-seater sofa, a 7 feet wide bed and a 32\\\\\\\\\\\\\\\" flatscreen television suspended over one corner. The bathroom with a view is located behind the bedroom. Junior suites(40sqm) are boast two glass walls for superb panoramic views. The entrance to the walk-up suite opens up to a leather armchair underneath a curving hardwood staircase. The upper landing is neatly kitted out with a small pantry and workstation. The bedroom has a two-seater sofa, a 7 feet wide bed and a 32inch flatscreen television suspended over one corner. The bathroom with a view is located behind the bedroom. Duplex suites(35+25sqm) are hotels iconic room type. The 30 square metre lower level has a powder room, a two person sofa facing the television, a chaise longue by the window, two chairs, and space to place an extra bed. The only room type without a work station, the duplex is truly a place to unwind.The solid hardwood staircase leads to a cosy 25 square metre open bedroom overlooking the living area below. An additional television stands at the foot of the bed. The master bathroom is a few steps up, through sliding wood panels that can be shifted so guests soaking in the tub can enjoy clear views. 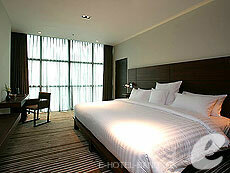 Duplex Suite ( Double )(35+25sqm) are hotels iconic room type. The 30 square metre lower level has a powder room, a two person sofa facing the television, a chaise longue by the window, two chairs, and space to place an extra bed. The only room type without a work station, the duplex is truly a place to unwind.The solid hardwood staircase leads to a cosy 25 square metre open bedroom overlooking the living area below. An additional television stands at the foot of the bed. The master bathroom is a few steps up, through sliding wood panels that can be shifted so guests soaking in the tub can enjoy clear views. Deplex Corner Suite(35+25sqm) are slightly larger than the average Duplex Suite overlooks the main thoroughfare and has a more expansive view.The lower level has a powder room, a two person sofa facing the television, a chaise longue by the window, two chairs, and space to place an extra bed. The only room type without a work station, the duplex is truly a place to unwind.The solid hardwood staircase leads to a cosy bedroom overlooking the living area below. 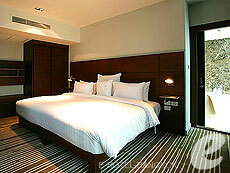 An additional television stands at the foot of the bed. The master bathroom is a few steps up, through sliding wood panels that can be shifted so guests soaking in the tub can enjoy clear views. Deplex Corner Suite ( Double ) (35+25sqm) are slightly larger than the average Duplex Suite overlooks the main thoroughfare and has a more expansive view.The lower level has a powder room, a two person sofa facing the television, a chaise longue by the window, two chairs, and space to place an extra bed. The only room type without a work station, the duplex is truly a place to unwind.The solid hardwood staircase leads to a cosy bedroom overlooking the living area below. 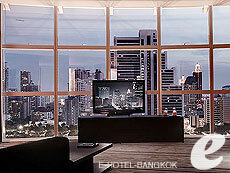 An additional television stands at the foot of the bed. The master bathroom is a few steps up, through sliding wood panels that can be shifted so guests soaking in the tub can enjoy clear views. 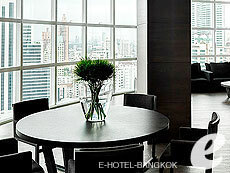 Panorama View Suite ( Single )70sqm) has a wall of curved windows running along one side. Near the entrance, a marble topped pantry counter seamlessly widens to a marble topped workstation diagonally opposite a small living set arranged near the windows. The 8 foot wide bed stands in pride of place against the far wall. 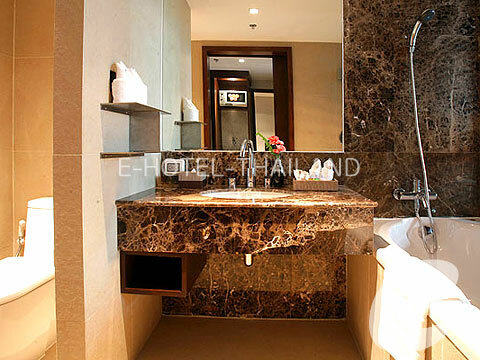 The spacious bathroom hidden along the interior wall is warmly lit.